Passover is always observed on the 15th day of Nissan of the Jewish calendar. About 3000 years ago the Israelites were enslaved by the Egyptians under the rule of the Pharaoh Ramses II. According to the Book of Exodus - Moses, a simple Jewish shepherd, was instructed by God to go to the pharaoh and demand the freedom of his people. Moses' plea of let my people go was ignored. In response God unleashed a series of 10 terrible plagues on the people of Egypt (Blood, Frogs, Lice, Wild Beasts, Blight, Boils, Hail, Locusts, Darkness, and the Slaying of the First Born). The holiday's name - Pesach, meaning "passing over" or "protection" in Hebrew, is derived from the instructions given to Moses by God. In order to encourage the Pharaoh to free the Israelites, God intended to kill the first-born of both man and beast. To protect themselves, the Israelites were told to mark their dwellings with lamb's blood so that God could identify and "pass over" their homes. The Pharaoh was unconvinced and refused to free the Jewish slaves - until the last plague. When the Pharaoh finally agreed to freedom, the Israelites left their homes so quickly that there wasn't even time to bake their breads, so they packed the raw dough to take with them on their journey. As they fled through the desert they would quickly bake the dough in the hot sun into hard crackers called matzohs. Today to commemorate this event, Jews eat matzoh in place of bread during Passover. Though the Jews were now free, their liberation was incomplete. The Pharaoh's army chased them through the desert towards the Red Sea. When the Jews reached the sea they were trapped, since the sea blocked their escape. It was then that a miracle occurred. The waves of the Red Sea parted and the Israelites were able to cross to the other side. As soon as they all reached the other side the sea closed trapping the Pharaoh's army as the waves closed upon them. Then as the Israelites watched the waters of the Red Sea sweep away the Pharaoh's army they realized they were finally free. 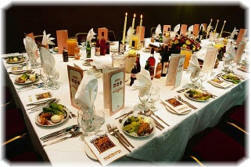 Taking place the first 2 nights of the 8 day holiday, the Seder is the most important event in the Passover celebration. Usually gathering the whole family and friends together, the Seder is steeped in long held traditions and customs. Special foods, plates, silverware are all a part of the Seder. Kitchen utensils and dishware normally used in the home are not be used during Passover. Leading up to the first night of Passover, the home is cleaned and cleared of all yeast foods, called hametz. Only foods that are "Kosher for Passover" are allowed. No leavened (containing yeast) foods or grains are eaten. In their place matzoh and foods containing matzoh are eaten. This is to commemorate the Israelites who fled quickly into the desert with no time for their breads to rise and were forced to bake the dough into hard crackers in the desert sun. All foods prohibited during Passover must be disposed of the morning of the first night of Passover.